When I left for London from Sydney in Australia nearly four years ago I thought it was a fantastic city in so many ways - a beautiful climate, a beautiful harbour city, and beautiful, warm, friendly people. But there is one thing that Sydney was not, and that's a cycle-friendly city. Indeed, American cycling academic John Pucher described it only last year as "the most hostile city to cyclists in the developing world." It's true. Sydney was especially afflicted by the sort of broad and fast roads that planners loved to build in the 1960s, and the city drivers reacted accordingly - they drive fast and hard and God forbid anyone who might find themselves in their way. And if the hills of the Elizabeth Bay loop don't finish you off, the 'retro' (read ancient) number 311 bus will. After years of Australia being in the grip of sports cycling image branding, the approach to the image of bike riding is changing. People are re-discovering the joys of sit up and beg bikes and a more relaxed and everyday style of riding again. The always appropriately attired Saskia at Sydney Cycle Chic is doing a great job of showing you don't have to dress like Lance Armstrong to get around town, whilst artist, blogger and film maker Mike Rubbo is doing a great job of promoting the virtues of upright bikes at his aptly-named website Sit Up Cycle. Mike is convinced that more people need to be reminded of the joys of riding a safe, comfortable upright bike if a true cycling culture is to emerge in Australia; that there's nothing wrong with sporty bikes or riding fast, but that a mono culture is no kind of culture at all. His recent exhibition at the Tap Gallery in Surrey Hills of sketches and lino prints of upright cyclists was a big success. I'm a big fan of his art work and was thrilled to receive the below beautiful print in the post today. 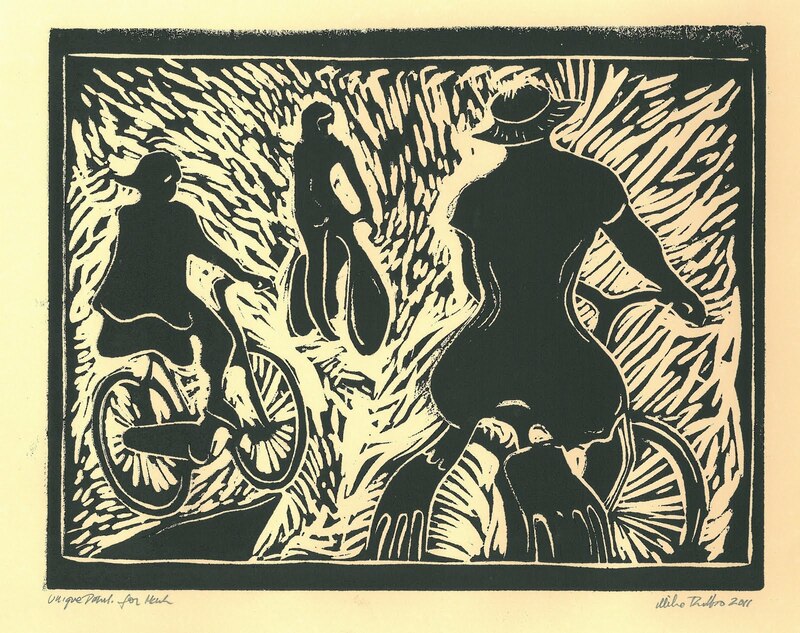 I love how the scratched background reminds me of the Australian bush, and the dynamic between the lady on the bike with the big bum and the gent on the bike to the left fascinates me. And of course, there's Sue. L'nfant terrible of the Australian bike blogging world, the charming, vociferous and wildly coiffured Sue Abbott of Freedom Cyclist blog has been in and out of Court of late contesting her convictions for - quelle horreur - riding a push bike without a helmet in a country where the cycling scene is ravaged by its ridiculous and ineffectual mandatory bicycle helmet law. And now the City of Sydney have released these fantastic short films celebrating the city's cyclists and cycleways. They're great; they advertise the new infrastructure which is just waiting to be explored as well as demonstrating that anyone - fast or slow - can ride a bike to get from A to B. There's handsome young dad Anthony zipping in to work, older riders Les and Judy ("At our stage in life we've worked out what we like doing, and now we are doing it. "), single speed chicista Kitiyia and beach mum Caroline re-discovering the simple joys of getting around on two wheels again. Here in London we've had a similar raft of great promotional films, and I'm convinced these kind of aspirational adverts really do work. It's just here in London its, well, a shame about the rest of it. Blackfriars Bridge, anyone? We at ibikelondon approve; Australia may be late drawing up a chair to the cycling revolution table but we're slowly looking forward to riding a bike again when we eventually move back. ibikesydney here we come! Thanks for this lovely summary of all the great things being done by the down under cycling utilitarians. Sure that one day they will sort out that silly helmet law as well. I'm totally jealous, Mark! Great post - I'm moving to Sydney soon after 9 years in London loving my bike freedom, and wasn't looking forward to Sydney's transport system - now lookign forward to it a lot more! I'm from Christchurch and they've just put out the draft urban plan to rebuild the city - and segregated cycle lanes, parking and provision are a top priority for transport. traffic lights which give cyclists a head start - now theres an idea to stop those left-turn accidents. more good news from down under! some cooler helmets would be nice though. You'll love it in Sydney Ben, it really does have so much going for it and the cycling rates - though lower than London - are growing pretty fast. Thanks for the link to the Christ Church plan, I'll be sure to check it out. What happened there was terrible, but if something great can be built to rise up from the ashes then that can only be a good thing. Such a lovely post with great videos. I really enjoyed this post and thank you for letting me see things I may never see in person. It's t´good to see improvements being made in different places: now we don't only have to point politicians at the Netherlands and get told "Oh, well it's flat there" as the excuse for ignoring the evidence. Again. I would like to invite you to my linky party on my bike blog called ‘Want It Wednesday’. Its very simple, by going to http://www.followingthechainline.blogspot.com/p/bike-bling-wednesday.html put your name and URL address in the linky Wizard. Then on every other Wednesday, blog about a piece of desirable bike kit that you want to own or even want to brag about, remembering to link back to my address so others can join too. It is a fantastic, fun and commitment free way for others to find your blog and read about you. It’ll increase you traffic to your blog and hopefully get you more followers. never been to Rome ? Mark, thanks for this post. Your website is always useful and informative, and also quite timely as I will be working in Sydney on cycle corridor studies during the month of September. Thanks for the update!